Excessive sweating, also known as hyperhidrosis, is a condition wherein a person sweats even in the absence of physical activity. It affects 2.8% of all individuals. Left untreated, it can cause skin to peel or become infected from being unable to dry properly. Hyperhidrosis is usually hereditary. However, it may also occur in people with underlying conditions such as a thyroid problem, diabetes, or an infection. It is also more common in people experiencing weight problems. There are two kinds of excessive sweating, classified as primary and secondary. Primary (focal) hyperhidrosis affects the hands, underarms, face, and feet. Sweating may be triggered without an apparent reason. Secondary (general) hyperhidrosis affects the whole body, or a larger part of it. It can be caused by excessive heat or a medical condition. Remedies for hyperhidrosis include antiperspirants, oral medication, and iontophoresis. Another suitable and longer-lasting treatment which Skin MD offers is the Botox injection. 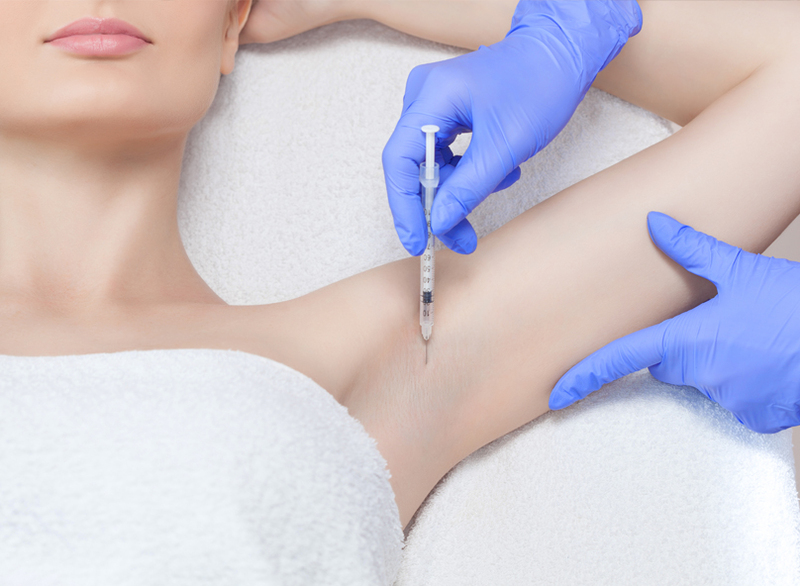 This procedure is mostly known for its anti-aging effects, but it also paralyzes sweat glands’ nerves and reduces the amount of sweat your skin produces. As a result, it saves you the hassle of applying anything or worrying about underarm stains and body odor. The benefits of a Botox injection can also last up to 6 months. Schedule a consultation with one of our dermatologists and find out if a Botox injection can help restore your skin and allow you to regain your confidence. Excessive sweating can definitely hurt your self-esteem. Our dermatologists are ready to help you find the right skin treatment, getting you started on rebuilding self-confidence. Excessive Sweating - What Are the Types?